"You know the rules," U.S. Rep. Devin Nunes told reporters on Monday, "we don't talk about committee business." But Nunes does talk about his work -- with hand-picked interviewers from President Trump's favorite media outlets. 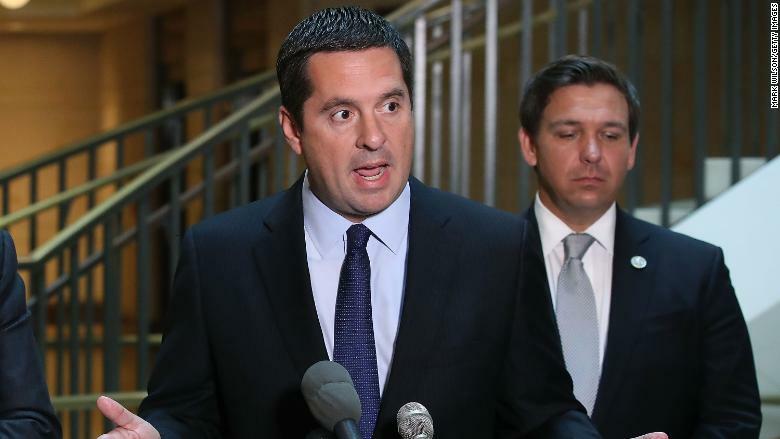 The House intelligence committee chairman has granted three interviews to Fox News since the release of his one-sided memo alleging that the FBI abused its surveillance authority. While some of the memo's main assertions have been disputed, Trump has embraced it as evidence of a plot against his presidency. Nunes is telling people to stay tuned, promising more revelations to come -- but he's really only speaking to Trump's base. He has declined non-Fox interview requests and avoided opportunities to speak with the Capitol Hill press corps. He briefly spoke with The Weekly Standard to clear up something he said on Fox last Friday. And he called into Rush Limbaugh's conservative talk show on Monday. Other than that, it's been all Fox, according to transcript searches. A spokesman for Nunes did not respond to requests for comment from CNN. The congressman's media strategy seems to be focused on the conservative echo chamber, rather than the public at large. This suggests his goal is affirmation -- reinforcing preexisting beliefs on the right -- rather than persuasion. Two media outlets friendly to the White House, Fox News and the Washington Examiner, received advance information about the memo's contents before the document was officially released last Friday. Hours later, Nunes gave his first interview to Bret Baier, the widely respected Fox News evening anchor. Nunes said the memo was only "phase one," triggering lots of headlines about the possibility of more to come. In the days since, skeptics have poked holes in some of the Republican memo's assertions and demanded the release of the Democrats' competing memo. But Nunes has only granted interviews to shows that are openly supporting his position. He was on "Fox & Friends" on Monday morning, Limbaugh in the afternoon, and Sean Hannity's Fox show on Monday night. In some ways he's taking a page from the president, by seeking out sympathetic interviewers. Much of his conversation with Limbaugh was about his dissatisfaction with the news media. "Almost every story is fake news," he said. "Almost every story that runs about me is fake." He said he ignores some journalists because "all they'll do is take whatever I say and take it out of context." On Hannity's show, Nunes claimed "the mainstream media is totally uninterested" in covering his allegations of surveillance abuse. "It's crickets from the media," he said, even though the memo fight has been one of the top stories in the country for the past week. In recent days, Nunes has sarcastically used the slogan of The Washington Post, "democracy dies in darkness," to claim his findings are being ignored. "I mean, democracy does die in darkness. The problem is the darkness is emanating from the mainstream media themselves. I mean, they refuse, they absolutely refuse to cover the truth," he told Limbaugh. On Tuesday, when CNN's Manu Raju asked Nunes if the White House had any role in the memo -- as has been widely suspected -- the congressman responded, "Democracy dies in darkness, my friend. Get to work." On the radio, Limbaugh urged Nunes to give more interviews -- not to journalists, but to sympathetic ears like his own. "The more the public can hear from you, the better. Unedited," he said. At the end of the call, Nunes said, "Hey, thanks a lot, Rush, and I'd love be to be on again."